The new limited edition vegan burger aptly named the “Impossible Burger” is infused with “haem”, the same iron-containing molecule found in meat. It’s haem, a component of haemoglobin, which gives meat its unique flavour. Through different trials, the company found that the haem in soy legumes have the similar properties as the ones in animal haemoglobin. As a result, the resulting burger can be made with 75 per cent less water, 87 per cent less greenhouse gases and 95 per cent less land than a beef burger. Air New Zealand is known for bringing fresh ingredients and healthier options on board its flights. While other airlines like American Airlines, Delta Air Line and All Nippon Airways serve meat based burgers in the airline. The Auckland based outfit is the first to form a partnership to serve a vegan burger on board. The limited edition Impossible Burger can be found in Air New Zealand’s Business Premier (business class) menu for NZ1 and NZ5 travelling between Los Angeles, United States (LAX) and Auckland, New Zealand (AKL). Boeing 777-300ER is used for these two flights and is configured with 44 Business Premier, 54 Premium Economy and 244 Economy seats. The Impossible Burger would be available from now until the end of October 2018. Impossible Foods CEO and Founder Dr. Patrick O. Brown says the company’s mission is to make the global food system more sustainable by making products that don’t compromise on sustainability, nutrition or taste. “We launched with high-credibility, innovative chefs known for their delicious burgers, so it’s no coincidence our first airline partner has been named Airline of the Year for five straight years. Travellers are demanding healthier food options during their journey. Airports and airlines are responding to this trend by introducing alternative food options like salad bars, poké bowls and reduced calorie menu on board and on the ground. 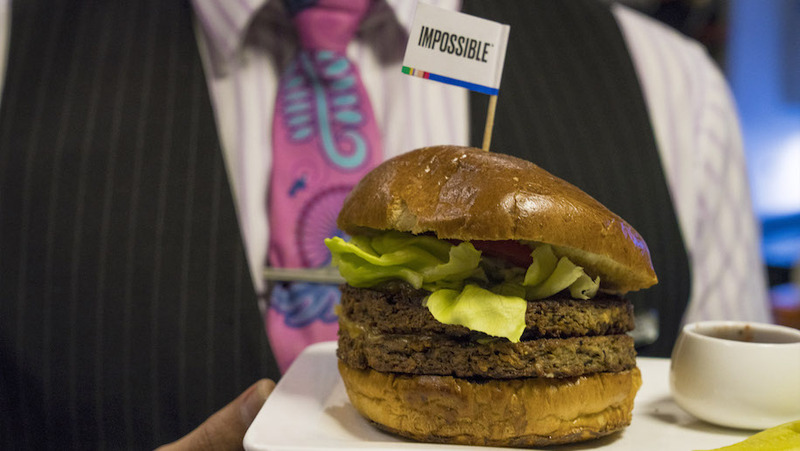 Air New Zealand’s strategy to be the first to introduce the Impossible Burger on board not only improves its visibility in the crowded airline industry but also shows potential customers that it will innovate with leaders to offer new food options. While the Impossible Burger is only available for a limited time, the airline should consider making it a staple on board and at its airline lounges should the burgers prove to be a hit with customers. Would you be interested in trying out this vegan burger?